THERE WERE TEARS today after Vicky Phelan was awarded an honorary doctorate by the University of Limerick. She received a false negative test after she went for a cervical smear test in 2011. Three years later she was diagnosed with cancer. Last January, she was informed she had months to live. Last April, Vicky Phelan was awarded €2.5m in damages in the High Court over the error. Her telling her story publicly led to the CervicalCheck scandal, which involves 209 women. “Here at University of Limerick, we aim to instil in our students the ability to reason, to solve problems, to participate as citizens, to play their part in the social and political life of this country. The conferring of a UL honorary degree embraces these ideals. It has been awarded to just a small number of women to date, including: the former President of Ireland, Mary Robinson; Adi Roche and Ali Hewson, for their contribution to volunteerism; and, to Catherine Day for her leadership in the European Commission, to name a few,” he said. “Vicky Phelan has had a major impact on people’s lives in this most difficult and precious time in her own. Through her courage, commitment and exceptional communication skills, she is highlighting a major issue in the Irish healthcare system. During all of this, Vicky has encouraged the women of Ireland to have faith and to continue participating in the cervical screening programme. 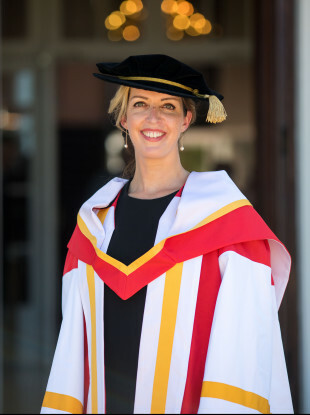 She is an inspiration to our students, our staff and our community, she has brought great honour to the university, and for this we have awarded Vicky Phelan an Honorary Doctor of Letters,” Dr Fitzgerald continued. After the ceremony Vicky Phelan also told reporters she plans to fund a person to be employed in a cancer care centre to provide patients with access to the latest groundbreaking drug therapies. She said she is personally willing to fund such position to “shame” the government into following her lead and provide for similar positions on a nationwide scale. “One of the things I want to see happening is that I would hope to try to fund a position, and that one position would lead to another, so I’m willing to do that. I think that if I got the ball rolling, it would be a goodwill gesture on my part, to again shame [the government] into doing it,” Phelan told reporters at the University of Limerick (UL) today. The mother of two has discussed her plans with Minister for Health, Simon Harris, and the idea is in its “early stages”. “If you’re given a terminal diagnosis, you should be sent to [such a] person, because the oncologists don’t do it - it’s not part of their remit,” she added. Phelan said she was “given no hope” when she received her terminal cancer diagnosis. There should be somebody you can go to who will help you to look up clinical trials or alternative drugs, because it’s not fair to give people no hope, and expect them to go home and accept that that’s your lot. “If I had done that I wouldn’t be here,” she added. Her “big focus” remains to push for all women with advanced cervical cancer to receive Pembrolizumab, newly licensed in the US, but which is not expected to be licensed in Ireland for another two to three years. Since last April she has undergone four rounds of the breakthrough drug and last week was informed her tumours had shrunk significantly. Phelan said she is now “feeling great, 100%”. However, she pulled no punches in her assessment of the health service. Asked if she had faith in the HSE, she replied: “Parts of it”. She praised paediatric services who are treating her daughter for a “congenital disorder”. A full commission of inquiry into the Cervical-Check scandal will begin in September, following the initial Scally scoping enquiry. Also present was Stephen Teap, whose wife Irene, from Carrigaline, Co Cork, was diagnosed with stage two cancer in 2015 and died on July 26 last year after receiving two false negative tests in 2010 and 2013. Vicky Phelan broke down a number of times under the strain of her ordeal. “I still feel we are weeks down the line and there is no real accountability, and I’m not happy with that to be honest,” she said. Phelan punched the air after receiving her honorary doctorate paper scroll from UL President Des Fitzgerald, proudly watched by her husband, Jim, and children Amelia (12) and Darragh (7), and parents John and Gabby Kelly. Email “Vicky Phelan receives honorary doctorate from University of Limerick”. Feedback on “Vicky Phelan receives honorary doctorate from University of Limerick”.